SCOTTSDALE, ARIZ. – Jan. 24, 2017 – Barrett-Jackson, The World’s Greatest Collector Car Auctions®, helped some of the most important charities in the world raise nearly $2.2 million benefiting groups including children, U.S. veterans and medical research during the 46th Annual Barrett-Jackson Scottsdale Auction on Jan. 14-22, 2017, at WestWorld in Arizona. Celebrities, pro athletes and top business executives donated collectible vehicles to cross the block for charity, including Rock and Roll Hall of Famer Steven Tyler, who sold his 2012 Hennessey Venom GT Spyder (Lot #3003) for $800,000, with 100 percent of the hammer price benefiting Janie’s Fund, a philanthropic initiative created by Tyler to bring hope and healing to girls who have suffered the trauma of abuse and neglect. Celebrities have become a part of the Barrett-Jackson culture, with many notable appearances over the past decade. This year, top billing for celebrity charity cars went to Aerosmith lead singer and former judge on “American Idol,” Steven Tyler. His personal Venom GT (Lot #3003) is one of 12 created and the first of the Spyder convertibles. One hundred percent of the hammer price is benefiting Janie’s Fund, which is dedicated to providing resources to help abused girls. 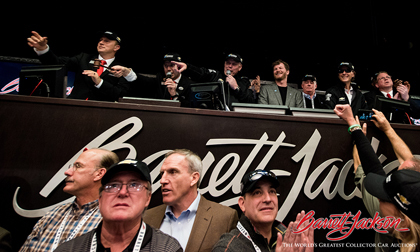 World-champion pro stock car driver and team owner Dale Earnhardt Jr. was on stage at Barrett-Jackson on Sat., Jan. 21, to help sell vehicles for the benefit of Nationwide Children’s Hospital, a leading pediatric care facility and research institute. Donated by Chevrolet, a 1970 Resto-Mod Chevrolet Chevelle (Lot #3006) that Earnhardt helped design brought $200,000, while the Hendrick Motorsports No. 88 Nationwide Chevrolet SS (Lot #3006.1) that he raced in NASCAR Cup Series races brought $200,000. 2012 Hennessey Venom GT Spyder (Lot #3003) – Rock star Steven Tyler sold his Venom GT, one of 12 created and the first of the Spyder convertibles. All of the $800,000 benefited Janie’s Fund, which is dedicated to providing resources to help abused girls. 2017 Ford Raptor Pickup (Lot #3004) – The last VIN Raptor produced for 2017 and finished in a unique one-of-one color; all proceeds from its sale of $157,000 and additional donation of $50,000 will benefit Juvenile Diabetes Research Foundation. 2017 Chevrolet Camaro COPO #001 (Lot #3002) – The SEMA show car represents #001 of 69 COPO Camaros to be produced for the 2017 model year; it brought $175,000 to benefit United Way. 1970 Chevrolet Camaro Z/28 (Lot #3001) – The original and fully documented Camaro was sold for $130,000 with proceeds going to Childhelp, which is dedicated to the prevention and treatment of child abuse. 2016 GMC Sierra Custom Pickup (Lot #3000) – GMC commissioned this one-of-a-kind Sierra All Terrain from renowned artist Mickey Harris that fetched $100,000 with proceeds benefiting Stephen Siller Tunnel to Towers Foundation and Building for America’s Bravest, which builds smart homes for our most catastrophically injured service members returning home. 1930 Cord L29 4-Door Brougham (Lot #3005) – One of only 5,010 produced, the sale of the L29 Cord for $300,000 will benefit Loma Linda University Children’s Hospital. 1970 Resto-Mod Chevrolet Chevelle (Lot #3006) – a Dale Earnhardt Jr.-designed vehicle and the Hendrick Motorsports No. 88 Nationwide Chevrolet SS (Lot #3006.1) sold as a pair for $400,000, with the entire hammer price going to Nationwide Children’s Hospital, a leading pediatric care facility and research institute. 2015 Ford Mustang GT Fastback (Lot #3007) – The “Jack Roush Tribute” Mustang went across the block for $175,000, with proceeds benefiting Military Assistance Mission, Inc., founded to provide financial support and morale aid to current Arizona active-duty military, their families and wounded warriors. Barrett-Jackson’s next automotive lifestyle event is scheduled for Palm Beach, Florida, on April 6-8, 2017. For full results of Barrett-Jackson’s 46th Anniversary Scottsdale Auction, follow the link to www.barrett-jackson.com.